The following article contains mild spoilers from the show, Babylon 5. We are currently living through an era that marketers have termed “The Golden Age of Television,” a time when new forms of storytelling and character development have resulted in some of the best quality programming the medium has ever seen. The 2000s brought with it a wave of new shows of a quality rarely before witnessed, in an abundance that had not been enjoyed before. Shows like LOST, Battlestar Galactica, Mad Men, and Breaking Bad all exemplified different narrative genres, but what each had in common was a dedication to complex characterization and storytelling. Of course, nothing happens in a vacuum, and there are several reasons why the quality of broadcast television began to rise. On one hand, traditional networks realized they had to make changes or risk losing their audience. Online broadcasters, such as Netflix, were beginning to produce original content and attract viewers by the millions. Networks were also fighting against premium channels, like HBO, who had long brought engaging new shows to market, like The Wire, The Sopranos, and Oz. The Sopranos, an example from the Golden Age of Television. HBO’s attempts to produce this kind of amazing content began in the mid-90s, a period when most of cable television was still comfortable using the traditional sitcom, setup-punchline format to entertain viewers. Television dramas were popular, but few engaged in the long-term story-telling and character development that marked the shows of the 2000s. The science fiction genre was not immune to this, and shows like Star Trek: The Next Generation, The X Files, and Sliders dealt mostly in episodic content. Though they took on trappings of more complex, long-term narratives over time, these shows were not designed from the ground up to present long form fiction. 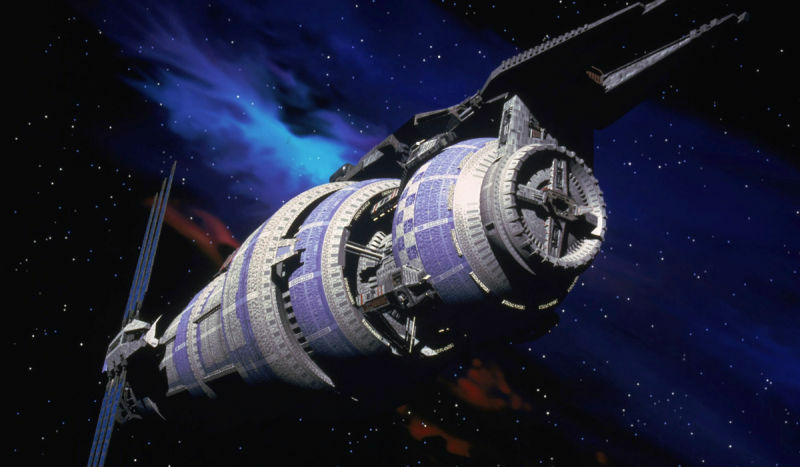 Although the concept of the long narrative sci-fi production was popularized in the 2000s by Battlestar Galactica, the 1990s produced a science fiction series arguably superior in many respects: Babylon 5. The initial cast of Babylon 5. Not all these characters would survive. Recognized with the Hugo Award for Best Dramatic Presentation, Babylon 5 was developed by noted creator, J.Michael Straczynski. Straczynski worked on several science fiction shows prior to developing Babylon 5 and concluded that a failure to make long-term plans led to these shows going over budget. Part of the reason he decided to focus the narrative on a single space station was to keep costs low, allowing the writers to focus on plot and characterization. Straczynski took an approach to writing his universe that would be considered standard fare in the modern age of television, but which at the time broke with many conventions. It was an adult oriented show that dealt with hard topics, like justifications for war, political turmoil, and complex arguments underlying authoritarianism and free will. This was a look at a serious universe where people were displaced by war, where poverty and social ills still wreaked damage, and where characters had to struggle with their own personal demons in order to succeed. Importantly, Straczynski led the writing of almost every episode, allowing him to construct a unified vision for his universe. With him guiding the narrative, long form story arcs were created that guided the writing of each episode. Whereas shows like Star Trek introduced recurring species who would occasionally form future threats, Babylon 5’s overarching narratives were almost impossible to ignore from one episode to another. The Earth-Minbari War was an important story arc. In the course of its writing, Bablyon 5 dealt with the mystery of what happened at the conclusion of the Earth-Minbari War, developed a long simmering feud between Earth and its colonies, developed the dominant story line of the Shadow War, as well as created long term story arcs for its characters. Not only were major plot lines treated with incredible reverence. Instead, individual characters and their relationships to one another matured and deepened over time. This took on many forms. For many viewers, the romance between Commander Sheridan and Delenn was rightfully the most memorable relationship on the show. From the onset, it was an intriguing pairing. Sheridan was a veteran of Earth’s military, which should have rightfully lost to the race of Minbari, to whom Delenn belonged. Over the course of four seasons, their relationship deepened. Exploring the mysteries surrounding the Earth-Minbari War not only shed light on major plot points, but allowed both characters to grow independently and, eventually, as a romantic couple. Londo and G’Kar, two of the most fascinating characters from the series. However, a potentially even more intriguing relationship occurred in the hostility between Londo Mollari and G’Kar. Londo was a member of the powerful and wealthy Centauri Republic, a nation that was in its waning years. G’Kar was an ambassador of the Narn, a race of people whose home world had formerly been occupied by the Centauri. Londo was positioned as vain, materialistic, and power hungry. G’Kar, in contrast, though hateful of the Centauri, became increasingly spiritual and kind as the show progressed. These men took two very divergent roads on the show. As the Centauri aligned themselves with the vicious Shadow race, Londo ascended to the heights of power. G’Kar, meanwhile, continued to guide his people as a religious figure. Londo’s pursuit of personal gain and the Centauri’s ill-advised alliance with the Shadows put Londo on the imperial throne, but ended with his world devastated by war. Although G’Kar died as a prisoner, his efforts during his lifetime inspired not only the spiritual growth of his people, but their persistence and ability to flourish again even after a devastating war. For all that went wrong in the universe, some things did go right. Babylon 5 never shied away from intense storytelling, did not feel committed to writing traditionally ‘happy’ endings, and seriously addressed the consequences of war. In an era when cable television was still dominated by old formats, episodic content, and light character development, Babylon 5 broke form and created deep, lasting narratives with powerfully written characters. These stories didn’t always end happily, but they were always written well. For its many contributions, Babylon 5 was ahead of its time. Edit: Given that this has been the most popular page written for this site since its inception (thank you J. Straczynski for the retweet), I figured it wouldn’t hurt to add an addendum saying thanks to everyone who stopped in and enjoyed the article. Please stick around in the future for more in the world of writing and sci-fi. I am glad this was written, Babylon 5 is the best SF show ever on the air, and should get much more recognition then it does, as J. Michael Straczynski as well. It has been my passion for 20 years, and touched me very much. It is better then any of the Treks, and Star Wars too. You have to be sharp and on top of it all to watch this show. So, anyway, thanks for the article. Thanks so much for stopping by! I do agree it’s an amazing show. The creators obviously cared a great deal about it, which is reflected in its intricacy and attention to character. Hope to see you around here again sometime! I’m in my early 20s and to this day Babylon 5 is my favorite show. I cannot explain exactly why, but the more you watch it, more you peel through the story. Hints are served, put on hold and given at the perfect time to still intrigue you. Many will flee because of the quality of visuals sadly and it is too slow based for a modern viewer. Thanks for the article! I think if audiences put up with the slow build of shows like Breaking Bad they could do it for B5. Obviously the show is a little outdated by modern terms, but it still holds up fairly well. It only takes a few episodes into season 1 before things start rolling. I’ve been saying precisely this for years. So many arcs, so many mysteries, some seemingly abandoned or not fully fleshed out, but the big ones brought to huge payoffs (the resolution of the Vorlon/Shadow conflict) that couldn’t really be compared to anything else in TV at the time. And certain minor characters — Zathras, in particular, as well was Zathras, Zathras, Zathras, etc. — are total gems. It’s a huge achievement, especially given the number of weird obstacles they hit– the loss of Michael O’Hare and Andrea Thompson, having to pull Patricia Tallman back in, losing Claudia for the last season, the cancellation/restart, the unavailability of certain recurring-character cast members (Draal of the Great Machine)… not to mention low budget and actors of uneven talent (Jerry Doyle played Michael Garibaldi very well indeed 90% of the time, and I loved loved loved the character, but I suspect wasn’t a great actor overall and had limited range, based on the few other things I saw him in). The “Babylon Squared/War Without End” episodes– especially given the juggling act and rewrite needed to work around the introduction of Sheridan– were up there with Back to the Future II in the cleverness of how the time travel action played out. I always felt the best metaphor for JMS on B5 was to compare him to a chef who manages to somehow prepare the best meal of his life when presented with a kitchen full of a mix of fresh, frozen and canned ingredients, with not enough of some things, forced to make last-minute substitutions and rejuggle half his courses on the fly. The meal presented, while not uniformly superb, was immensely satisfying taken as a whole. Not sure what prompted you to write this consideration of B5 right now, but thanks for investing the time to look back at this unfairly neglected TV milestone. One last comment: while there were plenty of episodes where tighter dialogue would have been welcome, there are many, many magic lines. I think of “I-I want a rebirth of glory, a renaissance of power. I want to stop running through my life like a man late for an appointment, afraid to- to look back, or to look forward.” Few things could sum up Mollari better, and show you what private fear of mediocrity, coupled with grandiose impulses for himself and his people, makes him so vulnerable to Morden’s temptation. It’s so… psychologically real. Thanks for the comment. You’ve touched on a lot here, but I will say I think the way the writers integrated the loss of actors is a credit to their preparation, having written complex characters with detail enough in their background to write them out. That’s a tribute to the preparation that was involved. I grew up with he show when I was 8. I have often rewatched the series during my life and each time discover new things about the show and reconnect in a different way to the characters as I change over time. It’s amazing how this show can keep me entertained even after 20 years. One of the marks of an amazing show is how it can keep reeling us back in. Circumstances change, but there are core essential human struggles that are timeless.